Jeff Plewman, the musician behind the experimental rock persona Nash the Slash and the band FM, has died at age 66. Nash the Slash was a mainstay in Toronto live music clubs throughout the 1970s and 1980s. He was known internationally after a world tour with Gary Numan and Iggy Pop and had opened up for the Who. Before performing as Nash the Slash, Plewman played in the prog-rock band FM in the 1970s. Two of his longtime friends and colleagues confirmed Plewman’s passing to CBC, though details are sparse. 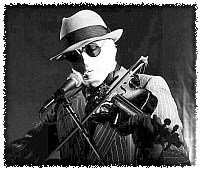 Nash the Slash appeared on stage in a black tuxedo, top hat, dark sunglasses and wrapped in bandages. It would become his signature look. His bandaged appearance from 1979 onward prompted many questions about his mysterious identity. He started the independent record label Cut-Throat Records, which he used to release his own music. Among his albums was Decomposing, which he claimed could be listened to at any speed, and Bedside Companion, which he said was the first record out of Toronto to use a drum machine. His biggest hit was “Dead Man’s Curve”, a cover of a Jan and Dean song. More recently, he played at Toronto’s Pride Festival and toured up until 2012. In 1997 Cut-Throat released a CD compilation of Nash the Slash’s first two recordings entitled Blind Windows. In 1999 he released Thrash. In April 2001, Nash released his score to the silent film classic Nosferatu. Plewman retired in 2012, bemoaning file-sharing online and encouraging artists to be more independent. “It’s time to roll up the bandages,” he wrote. He will be remembered for his experimental ethos as well as his unusual stage presence. “I refused to be slick and artificial,” Plewman wrote of his own career. There has not been word on how the musician died. I loved this guy’s music and his weird persona. I was a fan from the time that I started to get into music, over 30 years ago. People who actually read the setlists know that I would play one Nash cut every Circuit Breaker, and last night I played “Citizen” from his album And You Thought You Were Normal. Right about the time he passed on, perhaps…anyway, the lyrics of this could serve as his manifesto, and his obituary. This entry was posted in events and tagged event, obit. Bookmark the permalink.